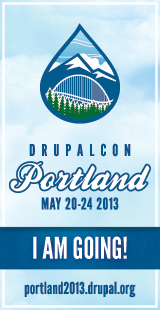 In just over a week, i’ll be attending my 4th DrupalCon in 5 years… this time in Portland. Catching up with friends and colleagues from North Carolina, specifically my friends at Appalachian State, who gave me the premise and more than a little help for the Hosted Drupal Service. Observing hipsters in the natural, original habitat. I’m sure there will be more than that to pique my interest, but that’s my initial plan. I am unsure if anyone else from NC State is going this time, but if anyone wants me to seek out particular information while i’m there, let me know. I’m planning on blogging/writing up some session summaries, or maybe just a day by day recap too, just like previous years.